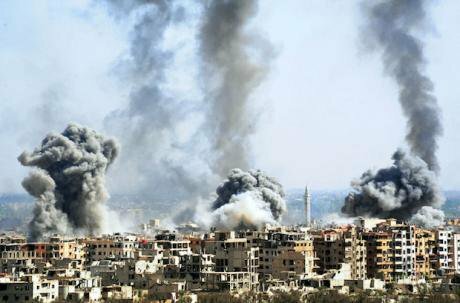 Smoke rises after the Syrian army's shelling targeted the Douma district in Eastern Ghouta countryside of Damascus, Syria, on April 7, 2018. Picture by Ammar Safarjalani/Xinhua News Agency/PA Images. All rights reserved. In addition to their regional and international allies, the two superpowers will shift from the tactical towards the strategic insight. Therefore, we should see more homogeneous new alliances than those found during the last years of war in Syria. There is no logic in the alliance between liberals and Islamists, as is the case in the strange partnership that let communists meet with capitalists. War conditions may have imposed these interim alliances, in which they get temporary goals to achieve the strategic objectives. In the Syrian case which is protracted since March 2011, it was common to see religious fundamentalists creating a political and military framework with liberals who aim to abolish religious manifestations in Syria and build a secular country. The National Coalition for Syrian Revolution and Opposition Forces (The Coalition), one of the most prominent Syrian opposition frameworks, includes politically incompatible entities such as the Muslim Brotherhood, Syrian nationalist opponents, and liberals. "The Coalition" is also allied with radical Islamic factions such as Jaysh al-Islam (the Army of Islam), an ally in turn of Hay'at Tahrir al-Sham (Levant Liberation Committee) formerly Al-Nusra Front; the Syrian branch of Al-Qaeda. Another example of the alliance of extremes is what we have seen between the Kurdish Democratic Union party PYD (the leftist with its identity and orientation) and the United States of America (the primary proponent of capitalist thought). The main forces influencing the Syrian situation are the United States through its main ally; the Syrian Democratic Forces, and the Russian Federation through the Syrian army and its loyal factions, as well as Iran, which supports Hezbollah and other factions such as The Brigade of Abu al-Fadl al-Abbas and others. Turkey entered the list of influential countries by tightening its control over the cities of Bab, Jarabulus, and Azaz, in addition to the Afrin region with the cities and towns adjacent to it from the west side.TheTurkish area of influence expanded through two military operations: "the Euphrates Shield" in 2016 and "the Olive Branch" in 2018 adding those territories to its area of influence in Idlib. The war against the "Islamic state" was a sufficient reason for the alliance of necessity between the SDF and the United States, but once that war ended, each returned to its first square. Washington aimed to weaken the Iranian role in the region through blocking the road between Tehran, Damascus, and Beirut, by controlling the Iraqi-Syrian border with Gulf funding, especially from Saudi Arabia, but can SDF play the role? It is not easy to do this task, because of the strong relationship between the Democratic Union Party (which is intellectually linked to the PKK and operates under the Ocalan ideology) and the "Islamic Republic of Iran". This relationship was created due to the conditions of hostility between the PKK and Turkey since the party rose in 1978 And then the declaration of armed struggle in Turkey in the mid-eighties. The conflict left hundreds of victims from both sides, and Turkey arrested the party leader Abdullah Ocalan in 1999. This conflict was a major reason to keep Turkey from joining the European Union. The PYD relationship with the Russian Federation was politically distinct, but its preference for an alliance with the United States in the east of the Euphrates River (rich Syria), where almost 90% of Syrian oil and more than 45% of gas sources are, led Moscow to take a step back in that political alliance. Russia supported Turkey in the battle of controlling Afrin Region (which constitutes with Kubani and Al-Jazeera the three sides of the democratic federation announced by the Democratic Union Party and its allies, northern Syria). The United States, according to president Donald Trump, has unambiguously declared it; the withdrawal from Syria is closer than ever, and Washington is unwilling to bear the costs of staying there. It bartered with Saudi Arabia (which wants an American presence for facing Iran) to bear the cost of U.S. military presence in Syria. American positions clearly indicate the lack of strategic importance of their presence in Syria. Therefore, they are willing to concede this card to any regional or international player, and this is not difficult, especially with a Kurdish issue in Turkey, Iran, and Iraq. So these countries, individually and collectively, are ready to exchange many of their cards with the Kurdish card that Washington holds. The US, British and French attacks on Syrian army positions, were according to the three countries launched to deter the Syrian government from using chemical weapons after their alleged use in the city of Douma in Eastern Ghouta, on the eve of the withdrawal of "Jaysh al-Islam" fighters. Such attacks could be launched again in the event that chemical weapons are again used allegedy by the regime. But the attacks also showed an absence of any clear strategic project on the side of the US, UK and France. The reality on the ground did not change, nor did the US attitude. It is likely that each state has a hidden agenda: Washington wants to limit Tehran's role in Syria, especially its presence in the border areas with Israel; London wants Russia to be punished against the backdrop of the case of the alleged poisoning of the Russian double spy Sergey Skripal; while France may be interested in entering the Syrian conflict and playing a role in the country. But is that possible? France is trying to enter the influence line of the areas controlled by the Syrian Democratic Forces and has advanced positions against the Turkish military operation in Afrin. It recently received a delegation representing the "Forces" and promised to increase its support. Indeed, France strengthened its presence in Manbj on the border adjacent to areas controlled by the Turkey-backed Syrian opposition. The Democratic Union Party may count on a stronger French role in Syria's future, but Paris' ability to resist the temptations, and the pressure of Turkey, Iran and Russia may not allow it to remain. So there is no real French project that can be counted on. The Democratic Union Party and its military system will have to find realistic solutions to the crisis resulting from the loss of their only military ally. It is clear that the United States is using its presence in Syria just as a bargaining chip. Therefore, returning to their former Russian ally may be the only option if they want a future for themselves in Syria after the American departure. Thus, they have to reach practical understandings that can save what can be salvaged from their decentralized project, which has several points in common with what Moscow is proposing as a solution to the Syrian crisis. The Russian-Iranian-Turkish axis appears to be more cohesive after reaching a common understanding on the outlines of a solution to the crisis. Therefore, their next goal is to re-establish control over the eastern Euphrates region, which requires painful concessions from all sides to reach a formula that will end the existing state of intransigence, and establish a stage in which Syria is stronger, more stable, and for everyone.